ENZYMES FOR DOGS and CATS -- The look of a healthy pet is unmistakable, power up his digestion with Enzyme Miracle-a complete plant-based enzyme supplement. Increase his nutrient absorption at each meal with one economical scoop. 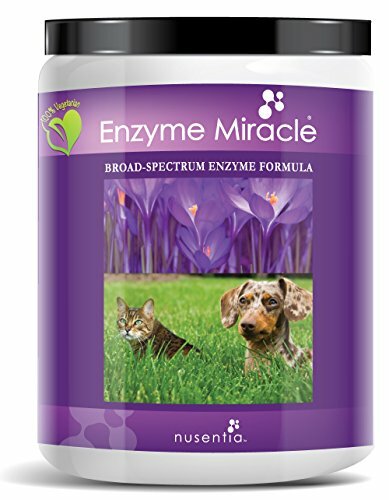 Complete support against digestive stress, toxin build-up, and developing pancreatic issues.Enzyme Miracle contains more of the right types of enzymes, in the right amounts, than any other pet enzyme formula. Why? Because it was made just for your pet, not a human. The result is more efficient overall digestive and systemic functions, and less "waste." Some enzymes carry systemic properties, which means they do more than digest food. These enzymes are helpful in removing and breaking down toxins that cause gas, yeast, inflammation, and other undesirable health symptoms. The powerful plant-based enzymes found in Enzyme Miracle have been carefully selected and balanced to be the perfect compliment to your pet's meals every day. Hugely beneficial for supporting dogs battling yeast, candida, and gas associated with poor digestion. ***Enzyme Miracle is 100% vegetarian and does not contain any animal based materials. While pancreatic enzymes may work well for some, Nusentia believes that vegetarian enzymes work best with the least amount of side effects. Pancreatic enzymes do not go to work right away and can cause numerous side effects in dogs. 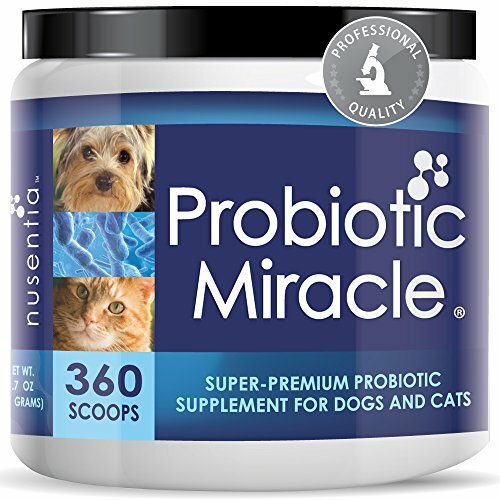 NUSENTIA Probiotic Miracle for Dogs and Cats Save $13. Eliminate Diarrhea, Constipation, Loose Stool, Yeast and More. Made in USA. GMP Certified. Get the Original Probiotic Miracle for Pets! 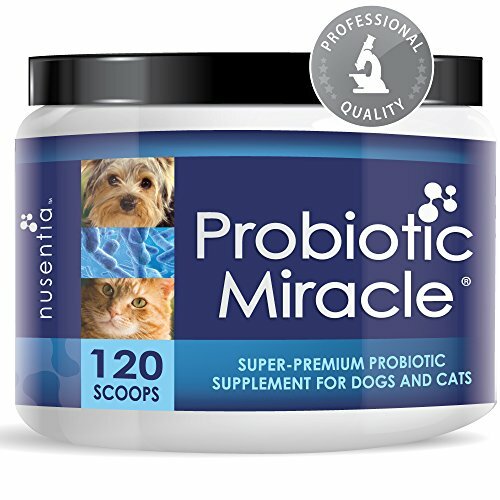 Probiotic Miracle, Probiotics for Dogs and Cats by Nusentia is scientifically researched and backed by years of outstanding reviews from pet parents. Proven to treat digestive conditions like diarrhea, constipation, and loose stool! Also eliminate yeast issues on the inside and on the skin, improve digestion, gas and bad breath. It's a powerful way to get your pet healthy and stay healthy! Countless pet owners will tell you the amazing results they get from daily pet probiotics from Probiotic Miracle. PLUS... your dog or cat won't even detect the powder on the food. One economical scoop per day is all it takes to get a perfectly healthy animal. Achieves Total Digestive Health - Restores intestinal balance of microflora (bacteria) - Strengthens healthy immune response and blocks our bad bacteria from attaching to the gut - Improves bowel movements And The Best Part Is... - Veterinarian Recommended, Safe for wellness and therapeutic dosage - Made in the USA - No Refrigeration Required - No Fillers - No Flavors - No byproducts - Gluten free, corn free, sugar free QUALITY AND RESULTS GUARANTEED OR YOUR MONEY BACK - It doesn't happen often, but if you aren't completely satisfied with Probiotic Miracle, just request a complete refund! TAKE ADVANTAGE OF THIS ON SALE OFFER FOR THE AMERICAN DOG OWNERS PROBIOTIC OF CHOICE! 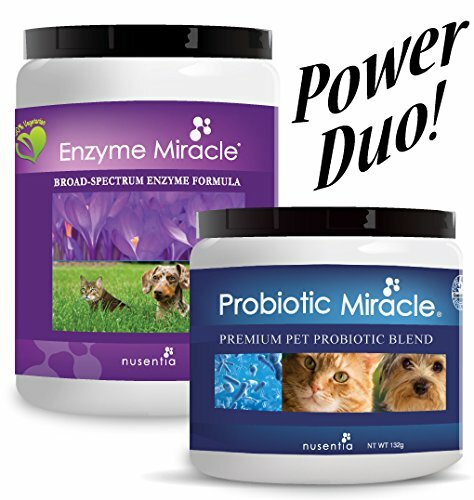 Digestive & Immune Power Duo - Enzymes + Probiotics for Dogs and Cats! Eliminate Diarrhea, Loose Stool, Yeast Issues, Poor Digestion, Excess Shedding, Constipation, Bad Breath, and Body Odor! The best digestive remedy, gut and immune support for dogs and cats starts with the Miracle Pack. Just ask the pet parents that maintain their healthy pets with these products! The results are UNMISTAKABLE! This ON SALE offer from Nusentia gets you 15% off the #1 selling probiotics and enzymes for dogs and cats: Probiotic Miracle and Enzyme Miracle. UNBEATABLE VALUE! - Up to 360 doses per each canister (*see chart). UNMATCHABLE RESULTS! - No negative side effects. More pet parents trust Nusentia over other probiotics and enzymes. TOTAL HEALTH! -Improved stools and bowel function, less shedding, improved skin and coat, increased natural energy, eliminate yeast, better breath, reduced odor, tear staining, and MORE! Overall health is always improved with the Miracle Pack GUARANTEED OR YOUR MONEY BACK! We stand behind these products with an unconditional 60 day money back guarantee. TAKE ADVANTAGE OF THIS OFFER NOW and click the LINK above! Because you want to support your pet against diarrhea, yeast, loose stool, skin issues, yeast, and more. Guaranteed better health comes with every canister of Probiotic Miracle. 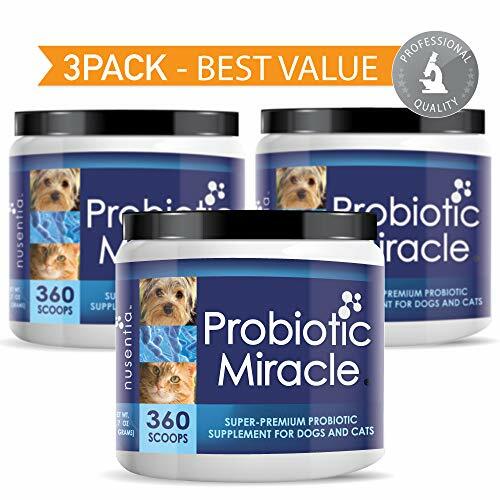 Pet Probiotics are the natural way to bring lasting wellness to your dog or cat, and, Probiotic Miracle is based on scientific probiotic researched just for pets. For this reason, we can guarantee that Probiotic Miracle will help the health of your dog or cat naturally. The word is out, and that's why the American pet owner's #1 probiotic of choice is Probiotic Miracle. Probiotics are essential for long-term wellness in pets. We make a concentrated, premium quality canine & feline probiotic formula that has stood the test of time. Stable microorganism strains (species) that pass through the stomach acid and bile to implant in the intestines. An economical scoop on your pet's food each day will keep him happy and naturally healthy, and he won't even detect it on his food! Perfect for dogs just off antibiotics. For best results in supporting your pet's digestion, try the Miracle Pack which also includes Enzyme Miracle. Probiotics for Dogs with Enzymes -Chewables (90ct) -Cats and Dog Tablets-Complete Digestive Remedy for Pets, Controls Gas, Loose Stool, Diarrhea, and More. Great Taste Dogs and Cats Love. Made in USA. Chewable probiotics for dogs and enzymes are a great way to help your dog or cat maintain excellent health. Probiotics and enzymes are gaining awareness for their incredible health benefit for pets. 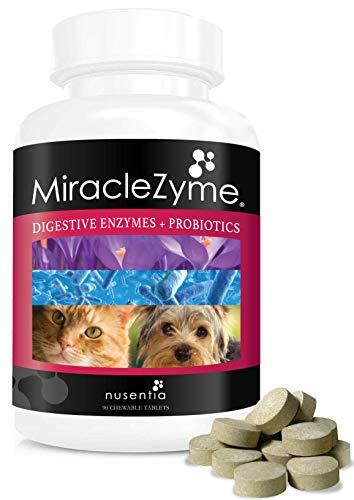 MiracleZyme chewable tablets deliver a complete formula for dogs and cats to support digestive and immune health-The results can be seen inside and out. Promote good digestion, regular stools and good breath. Vibrant coat, reduced shedding, and overall health abound when dogs are given probiotics. Probiotics crowd out bad bacteria that cause digestive upset, like, diarrhea, gas, loose stool, and bad breath. Enzymes help keep yeast and toxins in check for a clean efficient digestive and metabolic system. When your pet eats a processed diet, he NEEDS supplemental enzymes! Treat your dog daily as a wellness supplement, or increase dosage for therapeutic use if your dog is ill, has diarrhea, constipation, loose stool, or yeast. Nothing says you love your dog more than supporting the most foundational health organ in his body... the gut. See the amazing results for yourself! 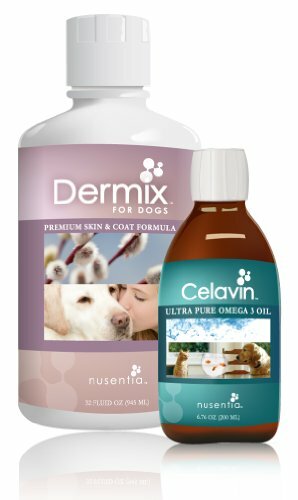 Prepare your dog for allergy season with Dermix for Dogs and Celavin Ultra-Pure Omega-3 Fish Oil - The perfect balance for immune health!Potentially hundreds of servings for YEAR AROUND supportNusentia natural pet supplements have been helping dogs support the symptoms that come with dog allergies. Our products are manufactured with the highest quality ingredients for maximum absorption and efficacy. Add Celavin (pure omega-3 fish oil) to your dog's diet. Fish oil provides essential fatty acids which can help reduce inflammation caused by dog food allergies and inhalant allergies. Use Dermix, a nutrition formula (Allergy, Skin and Coat) which contains anti-oxidant compounds, such as, beta-carotene, bioflavonoids, vitamins C and E, selenium, and sulfur-containing amino acids, which are needed to protect the body from the tremendous increase in free radicals that takes place during an inflammatory process. Grain free dog food can be a great option to boost your dog's nutrition and to prevent them from overeating. While grain free foods are often indicated for dogs that are suffering from food allergies, a wise approach to pet health suggests that all dogs can benefit from reducing or removing grain entirely. 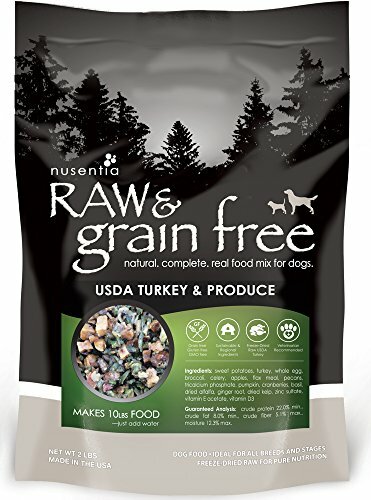 Grain free diets offer some basic nutritional advantages for the reason that grains in dog food are often used as inexpensive fillers to bulk up the food. If there is no grain, the usual result is a higher percentage of meat (protein) and other healthy ingredients. Without grains, dogs get the nutrition they need without overeating. Dogs are carnivores. Though we have domesticated them, they are built to eat like carnivores (i.e. like wolves, coyotes) and not like us humans. This means that the dog diet should consist of mostly animal with small amounts of fruits and vegetables, but most importantly, no grain. A dog in the wild would never eat grains like wheat, rice, corn, barley or millet.